While I was in Guilin it rained continuously. The heavy downpour usually kept me indoors or wandering from one restaurant to another. I had a chance to barter for a variety of fresh fare, from fish to frogs to turtles. Since the precipitation was intense most of the locals had headed for the shelter of their homes, leaving prospective customers scarce at dining establishments. The managers of the restaurants vied for my attention, energetically trying to usher me in to their eateries. I nonchalantly perused the edible creatures and estimated how appetizing they would be. One shopkeeper grabbed a toad and held it inches away from my face, but his tactic proved to be futile as I moved on to other options. I settled for a large fish after finding the exotic creatures too expensive for my liking. "Tis not the meat, but 'tis the appetite makes eating a delight." Four elemental temples are scattered around Beijing, with the Temple of Heaven the most spectacular of the quartet. The name of the temple in Chinese is Tiantan, which translates to "Altar of Heaven". On a cloudless summer's day, I wandered its grounds for several hours. As the sun shined up above, beads of sweat graced my forehead. Rivulets of perspiration slowly trickled downwards, tracing the symmetric lines of my face. Effortlessly combining aesthetic principles and cultural values, the design of the temple was similarily well thought out. Squares, representing earth, and circles, representing heaven, serve as the chief design motifs for impressive structures within the temple complex such as the Hall of Prayer for Good Harvests, the Imperial Vault of Heaven, the Echo Wall, and the Circular Mound Altar. 270 million years in the making, the Shilin Stone Forest is a collection of odd rock formations jutting up from the ground. Located in Yunnan province, Shilin was an easy bus ride away from Kunming. I remained steady as a rock when I entered the forest made of stone. All around me were the strange shapes. It was a dark and rainy day, so the formations seemed even more foreboding. Legend has it that the gods shattered the mountains into smaller fragments so that lovers could have some privacy among the rocks. The scientific explanation is that the area was an ocean before, and when the water subsided these rocks were left behind. As the global downturn continues many people can no longer afford their expensive hobbies. Instead they have sought out more cost effective means of entertainment. ARNABonics is one such beneficiary of this worldwide trend, as it is a fun, free, and educational alternative to pricey pursuits. ARNABonics is a nonstandard form of English where words in standard usage are concatenated to the tail end of the phrase ARNAB. Anyone can participate in adding new words to the vocabulary. Having rapidly gained in popularity in the past few years, ARNABonics is forecast to rank alongside solitaire, crossword puzzles, and sudoku as one of the primary pastimes of housewives by 2020. The grammatical rules are easy to learn. The words must seamlessly combine with ARNAB following a concrete syntax. They usually start with B (ARNAB + Bombshell = ARNABombshell or ARNAB + Babe = ARNABabe), but words starting with AB, NAB, and RNAB are also acceptable, though considerably more difficult to construct. As it is a growing field, new words are being continuously created and semantically defined. There is also room for innovation. The ARNACutie provides an interesting case study. Even though Cutie starts with the letter C, and distorts the natural harmony of the five letters A-R-N-A-B, it rhymes with the already established ARNABeauty and is thus a valuable addition to the vernacular. "Words - so innocent and powerless as they are, as standing in a dictionary, how potent for good and evil they become, in the hands of one who knows how to combine them!" I had gone to Longqing Xia, the site of my first attempted bungee jump, with an Argentinian and an American. The Yankee was promptly declared overweight by the Chinese attendant and was not allowed to jump. The Argentine and I emptied our pockets and and handed the American all our loose items for safekeeping. I had to leave my glasses behind, leaving my world an indistinct blur of colours and shapes. I followed the Argentinian up the stairs to the 68 meter high bungee jumping platform, grasping the railing as I could not see anything clearly. He would jump first. Ankle braces were tightened around his feet and he was led to the edge of the platform. At this point he was having second thoughts and grasped a hold of the guard rails with his hands. After waiting several moments for him to voluntarily take the plunge, the attendant calmly pushed the Argentine off the platform. A long schoolgirl shriek echoed through the gorge as he disappeared into oblivion. I was up next. Avant garde and trendy are usually words that come to mind when people are visualizing me, but in Beijing they are often associated with the 798 Art District. East German architects created the factory space in the Bauhaus style of design. At the cutting edge of China's cultural scene, the pedestrian friendly zone is a haven for creative types. Beijing's artistic community found a home in the formerly deserted warehouse area. Art galleries, boutiques, and cafes are peppered among the austere old buildings. Modern art, such as strange sculptures of mutants, line the alleyways. There is also a Nike Basketball facility, where a crowd had gathered to watch the action on court. A large picture of Lebron James adorns the exterior as China's basketball sensation Yao Ming is sponsored by rival Reebok. Nike, Reebok, and Adidas with its "Impossible is Nothing" slogan are busy combating China's homegrown athletic apparel company Li-Ning and their incomparable catchphrase "Everything is Possible". Fortunately, the contemporary artwork on display in 798 shows much more creativity. Our train arrived in the port city of Qinhuangdao, from whence we caught a bus to the Russian-flavoured resort town of Beidaihe. The beach was mediocre, the water dirty, the beer weak, the food terrible, and the women clothed, but apart from that it was a wonderful place. Since it was the 4th of July, we took a taxi to the local McDonalds ("Mai dang lao") and had dinner, before catching another taxi to Shanhaiguan. After being able to successfully bargain down the admission price at the entrance, we found out we were in some kind of wax re-creation of the Great Wall instead of the actual site itself. There was also a fake Buddhist temple within the complex. A "to park" sign gave us hope that the real Great Wall lay ahead of us, but the path took us back to the parking lot. We walked further down the road and finally found the real entry point into the "Dragon's Head" section of the world's largest military structure. I stood at the edge of the Great Wall, gazing out at the ocean. The Great Wall Beach Party is an annual event held in Shanhaiguan, the point at which the monumental structure meets the sea. With the Great Wall serving as an imposing backdrop, the beach is converted into a playground for drunken revelers. Busloads of fickle foreigners are transported to the site at night and then carted off back to Beijing in the morning. Three friends and I wanted to explore the area properly, with the party serving as a bonus attraction. We caught a train at dawn from Beijing. By the time we arrived at the site of the beach party we were quite sleepy, having woken up at 5am to catch the train. After a few false starts that involved rain, overweight women, and sleeping in hotel lobbies, we walked over to a sandbar from where we could both see and hear the party. Soon we were fast asleep. Around 2 am it became quite chilly. Half of our group fled to the safety of a hotel room, while the other fellow and I retired to the comfort of the hotel lobby for a few hours before walking back to the beach at 4 am to catch the sunrise. We finally made it to the party as it was on its last legs. After 15 minutes, we were napping on the beach again until 6 am. We then strolled to the Great Wall. Although there are crowd avoidance strategies that an experienced transit user can usually employ, sometimes he has no choice but to get on a jam packed bus. The population density becomes so great that it is not possible to count the number of people on board without falling asleep first. On one such busy occasion, I somehow found myself positioned between the two most attractive female passengers on the bus. I was tightly holding on to the overhead handlebars and trying to maintain my balance so as not to bop into either of the women, lest they form an incorrect opinion of the Prince of Honour. The bus was idling at one intersection for several minutes due to the heavy traffic. The temperature was pushing 40 degrees. Everyone was sweating heavily, using their arms to wipe the perspiration dripping from their foreheads or just letting it splash onto nearby passengers. As I was drying myself with one hand, I was knocked from behind with considerable force. I lost my grip on the handle bar and felt myself falling. I used the lady in front of me to stop my forward momentum. She instinctively turned around and shot me a dirty look. I also turned my head to see what was going on behind me. The other pretty lady was flat on her back. She had collapsed from heatstroke or some other malady. I delicately attempted to lift her up with the aid of a scrawny Chinese chap. We were having some difficulty until we were helped by the fare lady. Responsible for making sure everyone pays for their bus ride, the ticket collector was a big boned woman of sturdy stock. She pushed aside the crowd that had formed a circle around the prone body and picked up the young woman. She shooed away the occupant of one of the seats reserved for the sick, pregnant, and elderly, and dumped the knockout there. She had regained consciousness by now and was rubbing the shoulder she had landed on. The fare lady checked to see if the girl still had her wits about her. Once this was verified, she yelled at the bus driver to keep going. The remainder of the journey was not noteworthy. My love affair with poutine started at an early age and only strengthened throughout the years. As I celebrated Canada Day with an Irishman, a Malay, and an Argentine in China, I was treated to some poutine at the Goose and Duck. This Canadian-owned bar was hosting the July 1st festivities in Beijing. An individual with low cholesterol might ask "What is poutine?". Poutine is the closest thing to a national dish that Canada has. 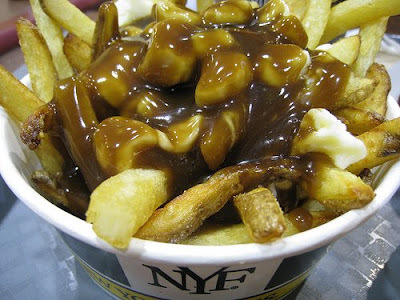 Its precise birthplace is unknown, but poutine originated somewhere in Quebec. The "heart attack in a bowl" is the perfect blend of French fries layered with cheese curd and covered in hot gravy. As it melts into a single entity, poutine becomes much greater than the sum of its ingredients. Poutine is to the stomach what I am to the soul. A feast for the senses, it is Canadian cuisine at its finest. "Oh, the tiger will love you. There is no sincerer love than the love of food." Most newcomers to Beijing have been warned in advance about the heavy traffic that they will experience in the city. This does little to prepare them for the gridlock that awaits them once they arrive. Weaving through traffic, whether in a vehicle or by foot is quite an endeavour. In rush hour, the approximately four kilometer long trip from my home in Dawanglu to my office in Guomao takes one hour by bus. There are four major intersections in between, and it takes 10-15 minutes to cross each one. If I am late leaving my apartment in the morning I walk one, two, or three stops down. The number of stops depends on how late I am. I board the bus when I have caught up to where I would have been in if I had been riding the bus all along. The cars, buses, and trucks spill on to the bike lanes once they have clogged up the roads. Smaller motorized vehicles, bicycles, and people fit through the empty spaces to be found amongst the larger vehicles, often barely squeezing past. Traffic comes from all directions. Although vehicular traffic is chaotic and slow, this is not to say that those walking are actually moving swiftly or smoothly. In fact pedestrians are waddling at a very relaxed pace, so as not to break a sweat, trip over uneven pavement, or collide with a defecating child. Sudden stops are not uncommon either, as a certain item being sold by a street side vendor may have caught their attention, they may have forgotten where they were going, or had the urge to clear their throats by collecting large amount of phlegm and indiscriminately spitting this out on to the street or on innocent bystanders. Although I have become adept at navigating the streets and sidewalks of Beijing, I have yet to perfect the latter practice.